Private tour to one of the New Seven Wonders of the World: Chichen Itza. We suggest an early start so you can see the ruins in the morning while it is cool and less crowded. When you finish exploring the pyramids of Chichen Itza, we will take you to an open cenote (cavern) where you can swim in the fresh, clear water. Next we'll have a gourmet buffet lunch with salads, rice, pasta, fish, chicken, beef and more! 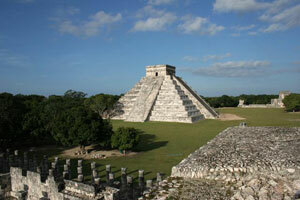 DOES NOT include guide in Chichen-Itza (Optional, approx. 1500 pesos for a 90 minute guided tour) or a tip to the driver if warranted. Itinerary: Drive time from Cancun is 2 1/2 hours. I suggest a 7 AM - 8 AM departure. Spend 2-3 hours in Chichen Itza, then go for lunch and to swim in the cenote. You can stop by the town of Valladolid on the way back to Cancun.